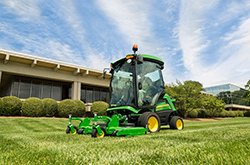 The John Deere 1500 Series TerrainCut™ Front Mowers offer comfort and versatility for landscaping and governmental operations. The 1550 TerrainCut boasts a 24.2-hp engine, and the 1570, 1575, 1580 and 1585 TerrainCut are equipped with 37.4-hp engine. All 1500 TerrainCut models can be equipped with a 60-in. / 72-in. 7-Iron™ PRO side discharge deck, or 62-in. / 72-in. FASTBACK rear discharge deck options. Available with a fully integrated, factory-installed cab equipped with air conditioning, the 1500 Series machines ensure operators can tackle the job at hand even on the hottest of summer days.